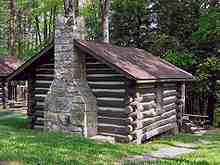 Log cabins were built by the pioneers on the frontier using materials available locally. Styles varied greatly across the US: the size of the cabin, the number of stories, type of roof, and the orientation of doors and windows needed to considered in cabin design. The source of the logs and stone and available labor, either human or animal, were also considerations. Appropriate site selection (1) placed the home in a location best suited to manage the farm or ranch and (2) provided the cabin inhabitants with optimum sunlight and drainage. The cabins were set on foundations to keep them out of damp soil but also to allow for storage or basements to be constructed below the cabin. Cabins with earth floors had no need for foundations. Cabin corners could be set on large stones and other stones were used at other points along the sill (bottom log). Since they were usually cut into the sill, thresholds were supported with rock as well. Cabins were built from logs laid horizontally and interlocked on the ends with notches. The best logs were old-growth trees with few limbs (knots) and straight with little taper that didn’t need to be hewn to fit well together. The length of one log was generally the length of one wall, although this was not a set limitation. Careful notching (the styles varied) minimized the size of the gap between the logs and reduced the amount of chinking (sticks or rocks) or daubing (mud) needed to fill the gap. Chinking refers to the mortar/infill material between the logs in the construction of log cabins and other log-walled structures. Some older cabins are log structures covered with clapboards or other materials. Nineteenth-century cabins used as dwellings were occasionally plastered on the interior. The decision about roof type often was based on the material for roofing like bark. The roofs of log cabins were of two types: purlin or a rafter. A purlin roof consists of horizontal logs that are notched into the gable-wall logs. The purlin roofs found in rural settings and locations, where milled lumber was not available, often were covered with long hand-split shingles. I love the gnarly, knobby look of these cabins and how immediately there’s a connection to the land. Cabins are honest they do not hide the materials that made them or the individual grit of the people that built them.